The Czech Goose is a breed of purely white, domesticated waterfowl that originated in the Czech Republic. These good looking water-birds somewhat resemble the Roman Geese, but are smaller in stature, and have been classified as a ‘light breed’. Apart from meat and eggs, the Czech Goose is also valued for its feathers. This breed is a landrace, and has been reared and kept in the Czech Lands for a few centuries. Though the detailed history of the Czech geese is not clearly known, they originated in the region of Bohemia, an area occupying the western two-third part of the then Czechoslovakia (now known as the Czech Republic), but were developed in Germany. 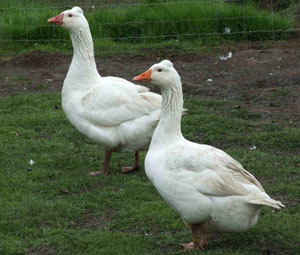 Until the middle of the 19th century, the Czech Goose was an extremely important source of income for small scale farmers. Every year, more than 50,000 geese were exported to Germany’s Bavaria, more than 1,000 tons of feathers to Switzerland, the Netherlands, Germany, and France, while Germany, Belgium and even England imported 100 tons of eggs. Later, this breed was standardized in the United Kingdom in 2008, while in Germany in 2009. This is an ideal breed for small-scale extensive farming. They became a popular poultry-bird, and were widely domesticated in the Czech countryside mostly because of the fact that it needs little space to thrive or to breed. 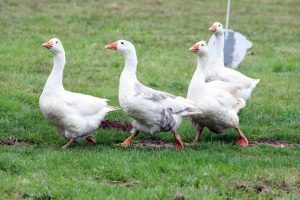 The goose is hardy, fast growing, and has a good grazing ability, making them a good choice for first-time or hobby farmers. They have lower feeding demands, making its breeding more profitable than other broiler hybrids or heavier breeds. The Czech females can lay anything between 10-20 eggs every year. They are also good mothers, with strong maternal feelings. The parents take care of the goslings until they are independent. 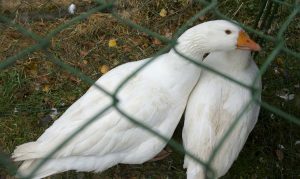 Since, this is one of the lightest goose breeds, the meat producing capacity is also much lower compared to the other breeds of geese. However, the quality of meat is known to be tastier and finer, and is a very popular table bird in the European cuisines, especially for the roast recipes. 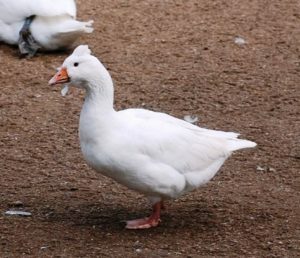 Czech Goose is the only breed of geese native to the Czech Lands. The feather of this waterfowl is so soft that, for many centuries, it had been a valuable material for filling pillows and quilts. When this breed was standardized in Germany in 2009, it was renamed as the ‘Bohemian Goose’.